For some time, I have wondered: why do women make up the majority of networking companies, but yet, not the majority of the top income earners? This also applies to a number of corporate environments in general. You just don't see as many women at the top. 75% of Network Marketing Professionals are women. You'll see a lot of men and some couples on the top income earners lists, but there is room for a lot more individual, women-run organizations on that list! We've got to change the status quo. In the first 6 months of 2017, I promoted quickly as I transitioned to my new company. Back in 2014, I was making $1,800 to $3,500 tops. Now, my months are significantly higher. I've learned a lot over the course of rapid growth, and I want to share some of the things I think are holding women back - in my opinion. Women often don't give or receive constructive criticism. I'll fess up - this is hard for me, too. It's hard to be coachable and not take offense or get defensive. BUT you have to allow your coach/mentor to give you real advice and feedback without getting upset. You have to constantly work at this if you want to get better and really benefit from a mentor. Allow people to tell you the truth. Likewise, you have to give the people you're mentoring constructive feedback, not just tell them what they want to hear. How can any of us get better if we are holding back and not really giving each other useful feedback to help improve our skillsets? We spend time where it is needed vs. where it is deserved. Women are natural caregivers. That means we can sometimes drag people along. We have to let people grow on their own, to experience their journey and match their energy. Coach the masses and mentor the few. Give people tools and resources for their journey. DON'T slow down and wait for them, make sure you continue on YOUR journey. Not everyone is on the same level or at the same point in their journeys. We all go at different paces. Some of us have learned a lot of hard lessons and are ready to go to the next level. 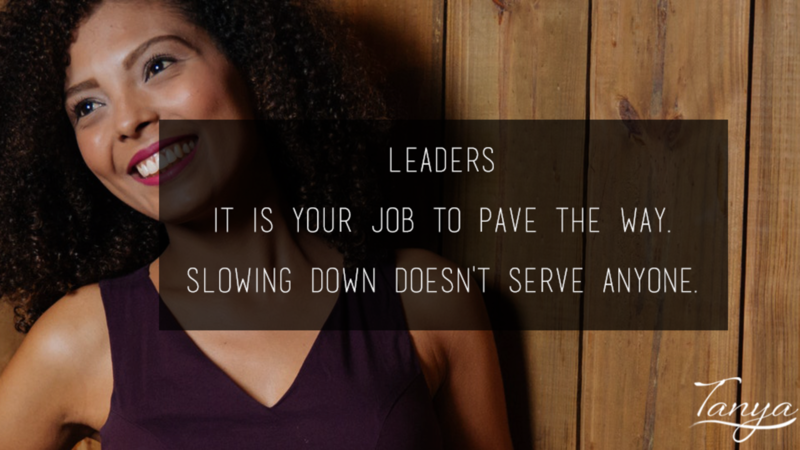 As a leader, it is your job to pave the way. Slowing down doesn't serve anyone. Society often labels confident women as "bitchy." The B-word: it is what some call you if you speak with conviction. I've been called it before in a corporate environment myself, but that is an old story. We have to move past the label! Women need to lead with confidence and conviction more often. We need to move and go first. We don't have time to worry about what everyone else thinks all the time. Let go, lead, move. People follow someone who knows where she's going and has conviction in what she is doing. Women may not make business decisions. A lot of the time, we fall in love with a product and share our love for the product. That's it. Remember, you are running a business. We have to make business decisions. This is a skill we have to practice all the time. You know you are selling an awesome product, why not own it? Stand firm and stand tall. You are doing something important. Learn to make more business decisions and do not stay in the same place where you started. Be decisive and be the business professional you know you can be. Nobody else is going to pay your bills! Beware and aware of misplaced loyalty to friends and products. Treat your business seriously- it is a career, and it is a worthy one. Learn to be more analytical. If you have a $100,000 per month goals and skills, make sure you are not in a $10,000 per month business. Take a look at your organization and the company as a whole; what are the statistics? Who are the top income earners and when did they build? Was the majority of their build 5, 10, or 15, or 20 years ago? What has their success ben in the last 1-2 years? Who started from scratch? Take a look at where you are. Are you learning from mentors that are getting the results you want? Are their figures the figures you want to have? If you continue to do what you are doing now, is there a way for you to get to your goals in the next 1-2 years? Find an example to follow. Realize what kind of vehicle your business acumen, skills, talents, and goals are suited for. Look at the numbers and treat this like a business and a career. Ladies, we have to get serious about this. We can make up a bigger percentage of the top income earners - we already make up a majority of this industry. Find your conviction, your confidence and let’s do this.